Iowa State’s long-standing commitment to economic engagement has earned it national recognition from the Association of Public and Land-grant Universities. APLU has designated Iowa State an Innovation and Economic Prosperity University. APLU launched the program in 2013 to recognize universities that are leaders in spurring regional economic development, and has since designated 54 institutions as Innovation and Economic Prosperity Universities. 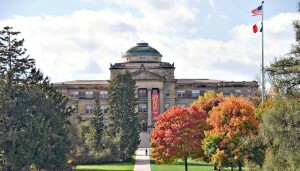 Iowa State is the first university in Iowa to receive the designation. “We’re proud to be recognized by APLU. This designation is affirmation of the breadth of our economic engagement programs throughout the state, our record of achievement and our plans for continued service,” said President Steven Leath. The designation required an extensive self-study, which involved an in-depth look at the university’s economic development enterprise, how it fits in the university’s strategic plans, how it’s communicated and what improvements can be made. Following the self-study, an independent team of experts reviewed Iowa State’s study and recommended the APLU designation. One of the reviewers said: “Economic development is in the DNA of ISU,” noting that Iowa State created the first statewide extension service in 1906, and economic development is one of the four goals in the university’s new five-year strategic plan. “One of the benefits of the self-study and the rigorous independent review process is that we get a fresh, candid view of not only what we’re doing well, but also what we can do better,” said Michael Crum, vice president for economic development and business engagement. Creation in 2014 of the Office of Economic Development and Industry Relations, which brought together key units involved in business assistance and economic development. In 2016, the office moved into a new, 42,000 square-foot facility in the ISU Research Park. Expansion of the ISU Research Park from 230 to more than 400 acres and 66 companies occupying 550,000 square feet of building space. Research centers that involve collaboration with industry, including the National Science Foundation Engineering Research Center for Biorenewable Chemicals and the BioCentury Research Farm, the first facility of its kind in the nation that integrates research and demonstration in biomass production and processing. Student opportunities that combine learning with professional development, such as CyBIZ Lab and senior capstone projects for undergraduate engineering students. During a five-year period ending in fiscal year 2015, more than 13,000 companies in all 99 Iowa counties received assistance from the Center for Industrial Research and Service and the Small Business Development Centers. More than one million Iowans each year benefit from ISU Extension and Outreach programs. Each Iowa State college participates in the undergraduate entrepreneurship minor coordinated and supported by the Pappajohn Center for Entrepreneurship. Iowa State is a co-founder and major partner in the Cultivation Corridor, a public-private partnership that seeks to make Iowa the world’s biosciences capital. Iowa State is the only university in Iowa ranked among the top 100 in the world for utility patents by the National Academy of Inventors and the Intellectual Property Owners Association.